#Focus – McLaren’s farewell to CanAm. The 1972 M20. – Historic Motor Sport Central. #Focus – McLaren’s farewell to CanAm. The 1972 M20. 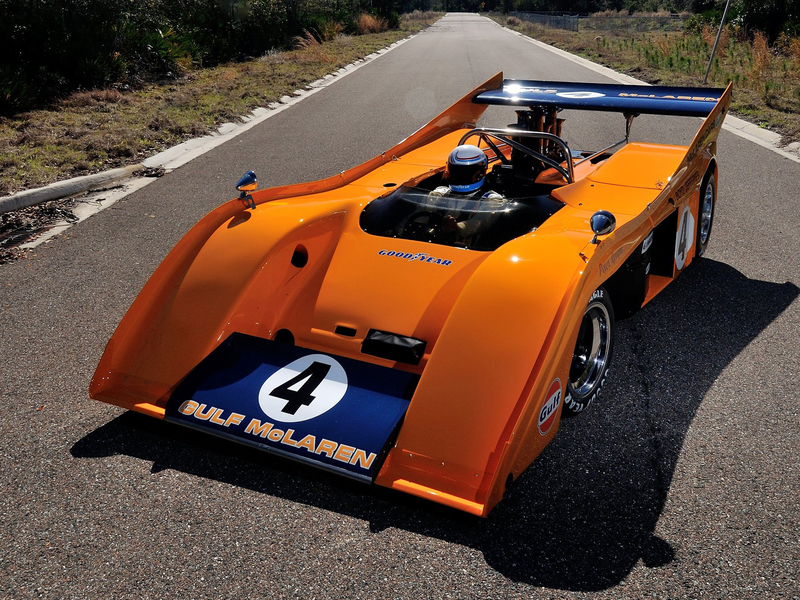 The CanAm – Canadian-American Challenge Cup – had been dominated for years by the mighty McLaren M8s. From 1968 to 1971, McLaren put on the show and won the championship 4 times in a row with the same model although it did evolve. Up to Bruce McLaren death on 2nd of June 1970 while testing the new M8D evolution, CanAm was known as the “Bruce and Denny Show” for the familiars of the American series. Peter Revson and the M20. Following a change of rules in the World Sportscar Championship at the end of the 1971 season and the engine capacity being limited to 3 liters for the new top category, Porsche which had already started campaigning its 917 in CanAm in 1971 would focus on the CanAm championship for 1972 as it decided not to follow the new WSPC rules. The McLaren answer to a manufacturer of this size joining the series with a purpose built car was the McLaren M20. 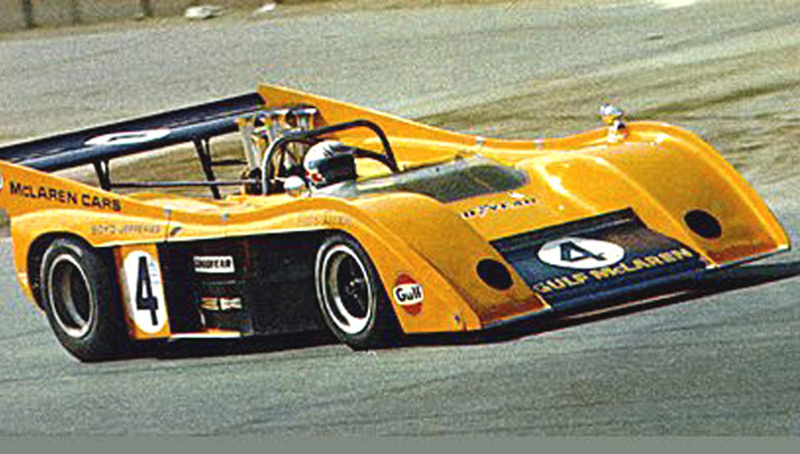 Designed by Gordon Coppuck and built in early ’72, the car began testing that same summer, yes, CanAm was traditionally a fall series. The car followed the trend set by the M8 and Coppuck added some ideas which came from the Formula One design, the radiators were moved from the front to the side of the chassis as far back as possible. The design followed the coke bottle trend which was a common practice in F1 but adapted to a CanAm design. The idea was to improve the balance of the car as putting the radiators there would place them as close to the centre of gravity of the car. Another feature followed as with no radiators in front of the driver’s feet, a massive front wing was fitted to the front of the car between the two front fenders and to balance that a full-width rear wing was fitted, the largest ever seen on a McLaren CanAm design. Other than that, the car featured a slightly longer wheelbase, 2 inches, compared to its predecessor in order to improve the weight distribution and balance. The design of the suspension remained conventional with top single link and bottom wishbones at the front and back. Engine side, Mclaren decided to stick to the naturally aspirated Chevrolet V8s “Big Block” that made their M8s so successful even if turbocharged version were under development. The capacity of the engine being of more than 8 litres – 8, 349 litres/509.5 cu.in. – and the design being all made of aluminium, it was light, reliable and powerful with more than 750 hp and you can wonder how the Hewland LG500 4-Speed gearbox could handle that as it had been deigned to handle 500 hp. But it did work as on the M8s..! But power was good if you considered the 690 kg of the car. 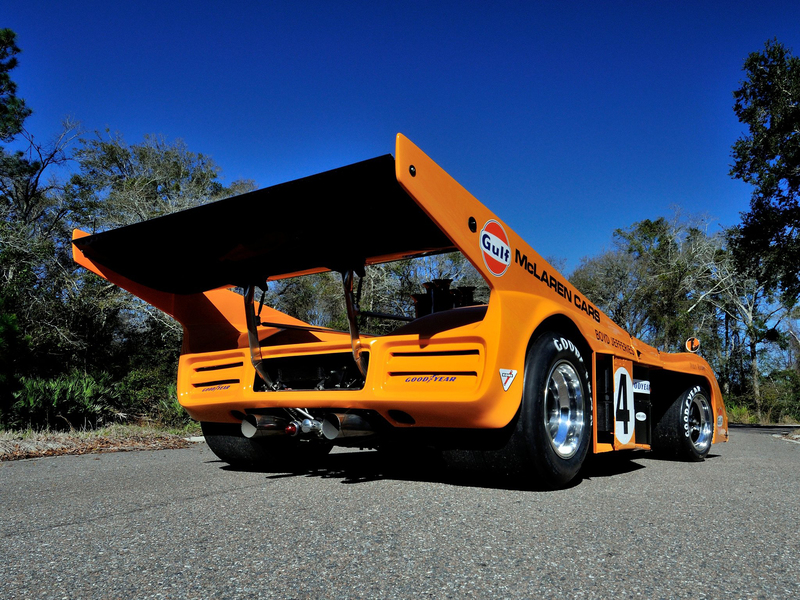 Yes, CanAm was pure madness, all about raw power and speed ! Let’s talk about the races now. Denny Hulme and Jackie Stewart, the Formula One champion were to be the drivers for the 1972 season. The testing went well in England and the for the first race Peter Revson was to be Denny’s team mate as Jackie was ill for the first round in Mosport, Canada. Denny and Peter did struggle during that first round with Mark Donohue and the new 917/10 turbocharged car taking pole position but bad luck would not stick and after Mark suffered engine troubles in the race, Denny was able to take the first win of the year at that same first round. Even if it ended well for McLaren and Hulme, Porsche was there and ready to win. Handling problems were cured for the second round at Road Atlanta and only a testing crash from Donohue would prevent him from taking part in the race, he was replaced by George Follmer who won the race in the 917/10 after Hulme had heavily crashed and Revson retired. The third round saw Denny and Peter taking the two first spots on the podium with François Cevert taking third in an old M8F McLaren. It was to be the last win for the McLaren works team that season, only Cevert would win a race with one of their design as the works team suffered many engine failures while trying to keep up with the dominant Porsche 917/10. McLaren would then turn its back to CanAm and would not come back the next year and would stick to its 5 titles in the category (1967-1971). Three M20 chassis were build, raced and then sold for CanAm and European Interserie which would then continue their life in the hands of the privateers. McLaren’s most advanced CanAm/Group 7 design and fastest so far would end up being its farewell to the category that gave so much to the team… The Panzer would go on and dominate the series until killing it with the later 917/30. Hulme leading Follmer and Cevert before crashing. 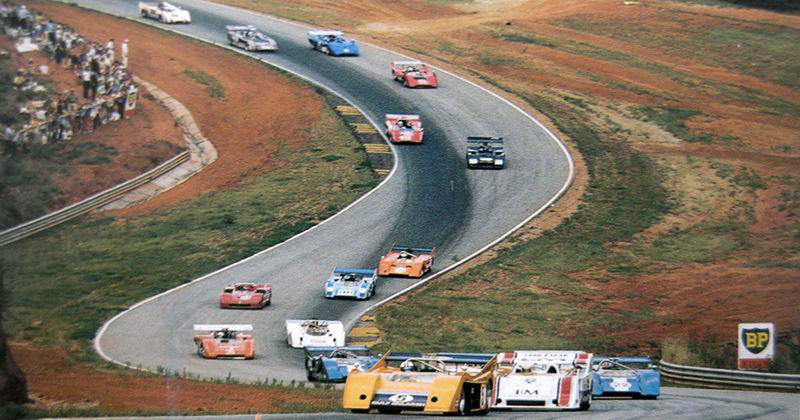 Road Atlanta 1972. Previous Previous post: #TouringCarMadness – The 1967 FVA Powered Ford Cortina Lotus Mk2. Next Next post: #TheThrillOfSpeed – Thrust SSC – Breaking the sound barrier.